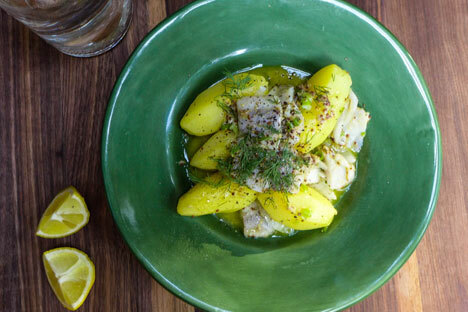 Culinary maven Jennifer Eremeeva shares a simple and delicious way to enjoy herring. My breakfast companion yesterday was a real gentleman in that lovely old way, which is rapidly disappearing. He invited me to the Yale Club, which is always a treat, held my chair out for me, and then asked very tactfully if I didn’t mind if he ordered kippered herring for his breakfast. He was at pains to tell me that if I would be in any way offended by the smell, he would go for the equally delectable corned beef hash. Over our sizzling fish and scrambled eggs, we noted that there doesn’t seem to be much middle ground about herring. People either love it – can’t get enough of it, in fact – or eschew it completely, shuddering slightly when you suggest any hint of herring. Luckily for me, I love herring and I’m in the right place to indulge in a herring binge any time I like. And because local food seems to be the watchword of the hour, this is a good time to explore new iterations of this important fish in Slavic and Nordic diets. You can get all chef-y and talk about poaching or marinating your own herring, but if you live in Moscow, as I do, there isn’t much point: there are whole herring aisles in Russian supermarkets filled with glittering jars containing herring in brine, herring in sour cream, herring in oil, smoked herring, herring with onion... the possibilities abound. I like to take plain marinated herring and play around with it in a series of warm salads, which are great for a quick autumn dinner or a long Sunday lunch. Herring’s natural soulmate is a potato. The robust tang, salty flavor, and complicated texture of the fish need something bland for contrast. I don’t, however, feel that beets and herring are a match made in heaven, although this combination, enhanced by potatoes, chopped egg, pickles, lots of mayonnaise, and shredded cheese, is the centerpiece of all Russian New Year’s Eves: “herring under a fur coat.” This is my red line. I’m not a fan! Herring under a fur coat is too complicated, too time-consuming. There’s too much mayonnaise and the herring is hidden under too many other flavors that are fighting together rather than working together. 15 ml (1 tbsp) of brown Turbino sugar. A simple and delicious way to enjoy herring without all the shredding, dicing and the lugubrious purple mayonnaise. Ideally, enjoy it outside in the crisp October air with a shot of vodka, an ice cold beer, or a nicely chilled white wine. Add some salad greens and a bit of Borodinsky bread and you have a marvelously easy and delicious meal! 1. Peel the potatoes and use a small, sharp paring knife to shape them into ovals with facets. 2. Steam the potatoes in a steamer or colander set over water at a rolling boil for 12-14 minutes, until the potatoes are still firm, but you can easily insert a sharp knife into them. 3. While the potatoes are steaming, combine the mayonnaise, horseradish, white scallions, mustard, sugar, lemon juice and zest, and half of the dill into a food processor fitted with a steel blade, or a blender, or the cup attachment of a hand-held processor. Pulse the ingredients to roughly combine, then, while the motor is running, pour the olive oil into the mixture very slowly, almost drop by drop. The mixture will gradually solidify and thicken into a loose mayonnaise. You want to be able to drizzle the sauce, so if it is too thick, add a bit more oil until you reach the desired consistency. 4. Drain the potatoes and toss them in all but a few tablespoons of the prepared dressing. Cover and let stand on the counter until they have cooled to room temperature. 5. Arrange the salad by combining the herring with the potatoes and drizzling some of the remaining dressing on the mixture. Garnish with the green scallions and more dill. Give the dish a hearty few grinds of the pepper mill. Serve with lemon wedges.